So this is the very definition of convenience-health-food. All you have to do is open packets, cut a thing or two, and pop some stuff in the oven. You take it out when you can see that the potatoes are good and golden. And if you get distracted watching youtube videos and updating a post – don’t worry unless it’s literally burning you can’t really mess this up. So yes, it’s very well done here – and it’s still good. Also, this is a heart-healthy meal, meaning this is the type of food which can help unclog your arteries – if you need that kind of thing. And if you’re fond of diet-be-damned recipes you probably do. Specifically it’s the salmon that’s so good for you. Salmon is a good source of omega 3 fatty acids, protein, vitamin D and vitamin B12. I read a great tip for salad about a year ago – cut them up. It’s so obvious now but before when I bought bags or packets of salad leaves I never thought of chopping up the leaves small. In fact even if I bought a head of lettuce I never would slice it up small. I don’t know why it never occurred to me to do this – considering the amount of times I’ve had lettuce explode off my fork in front of my face. Do you know what I mean? You manage to get a forkful of salad, a tiny bit of everything on it, and then as it’s making its way to your mouth the lettuce decides it’s time to stretch out and expand, usually right in front of your mouth so you have to choose between putting the fork back down or dislocating your jaw so you can fit the damn thing in. Salads… Heathy yes but also maddening. Anyway the tip was to cut up the salad and if you buy one of those salad bowls in the supermarket – snip, snip, snip – it becomes a better salad. I know you’ll get a much better, fresher salad if you buy the individual components and chop them up yourself. But if you’re up to doing that you’re not really in need of a convenience-health-food meal. This is more of a “I was thinking of getting a big bag of crisps and a frozen pizza” but then decided to be healthier. And this is a properly healthy meal. If you need any persuading about including salad with your meal – here are nine reasons to eat salad every day. In the ingredients I’m just going to say one supermarket salad bowl. Making a vinaigrette is really simple. To a jar you add one-third vinegar to two-thirds oil (or one half lemon juice to one half oil), some mustard, some sugar or honey if you like it sweet, some onion or garlic if you like, some fresh herbs if you want. And then you just shake shake shake, shake shake shake, shake your dressing, shake your dressing. Singing and dancing not optional. How to make a simple vinaigrette. 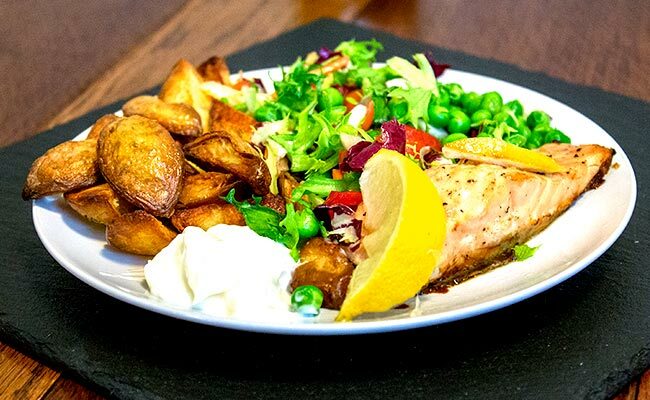 Frozen salmon fillets, baby potatoes, frozen peas, supermarket salad bowl. Prick the potatoes with a knife. Place them in a microwaveable dish with a couple of spoons of water. Cover the dish with its lid, or with a plate if it doesn't have one, and cook on full power for 3 minutes. Take a large piece of tin foil. In the centre add a teaspoon of oil. Place the salmon fillet on the oil. Add a sprinkle of freshly ground pepper and salt. Drizzle over a little lemon juice and add just a tiny sliver of lemon on top. Fold the opposite sides of the foil together to form a parcel around the fish. Place the parcel in the centre of baking tin. Cut the potatoes into quarters and place around the parcel of fish. Put the tin in the oven and bake until the potatoes are as golden as you like them - about 30 minutes should do it. Remove from the oven and allow to cool for a couple of minutes. Add some vinaigrette to your portion of salad. Cook a small portion of peas in the microwave. Serve altogether on a plate with some mayonnaise and a lemon wedge. Place the filet on the oil, sprinkle over some salt, pepper and lemon juice, and top with a little sliver of lemon. I’m very clumsy at making the foil parcels – it doesn’t matter though as long as it’s shut and leaving some room for air to circulate around inside it’s grand. Simple, quick enough – and really quite good for you. There’s about 22 – 23g in this meal. Not bad. Quite good really.